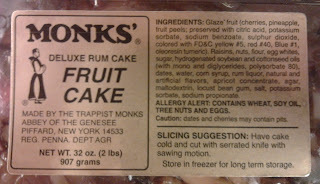 I purchased the two pound rum fruitcake from the Abbey of the Genesee. They also have a one pound cake (suitable for giving) as well as a larger round cake in a decorative tin. Didn't order it but based on the photo here it looks like a standard tin that I know I've seen with another fruitcake. 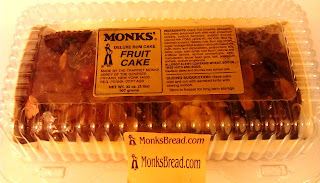 The two-pound cake was $19.95 with shipping which ended up being $26.75 to the middle of the country. Not great (do I mean the photo, or the ingredients? A little of both). Besides the standard ingredients, there were hydrogenated soybean and cottonseed oils, corn syrup, artificial flavors, agar, maltodextrin, locust bean gum, and some preservatives. There is a glaze on top, probably the apricot concentrate, which was neither distracting nor gooey, and gave it a nice finish. 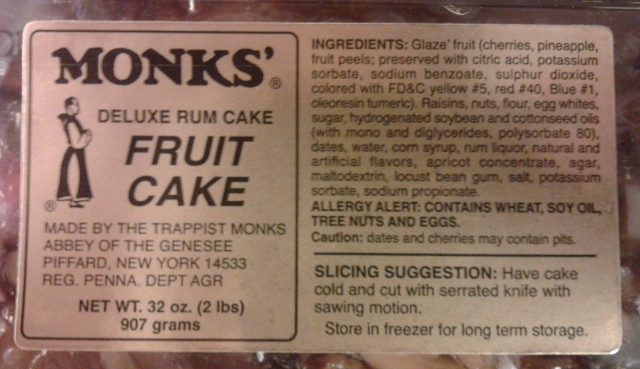 As you may have seen from the ingredients, the nuts in this cake are just marked as "nuts." I think we've seen this before--I'm guessing this is a way to hedge which nuts you choose to include, based on world nut stock prices, etc. Helpful Brother Paul at monksbread.com confirmed with me that they are almonds and walnuts. 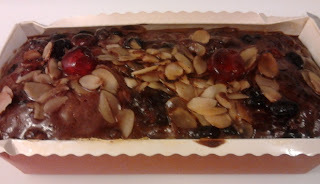 I have to say I like an almond in a fruitcake. The Claxton fruitcakes contain them. Their sweetness is a nice counterpoint to the darker richness of the walnut, and they give a nice texture to the cake. The fruits were your standard fruitcake mix (cherries, pineapple, fruit peel), with the addition of my personal favorite, the date. The booze was, as noted by the name, rum. There was a good amount - you tasted it throughout. Although the guar gums and preservatives worried me, the flavor was actually very good. There was a good amount of cake to fruit, so you could really taste the cake. The cake itself did not seem gooey or uncooked, but rather had a nice quick bread density: rich and moist. Yup, I've been eating it happily lo these many weeks since I originally posted about having purchased it. It's a good one! So now onto the next. What shall it be? I'd love your suggestions in the comments! This one sounds surprisingly good! I came across a unique fruit cake a few weeks ago and did not forward a link, presuming you were inundated with options. Will find and forward it! You make it sound appealing. But it's a heckuva lot cheaper than the Gethsemane cake, which for 2.5 lbs. is $37.75 plus shipping this year. Worth the difference? I'd say it's a shade less than the big G on quality of ingredients, but not bad overall. Yeah, it would be worth purchasing.